In this original and groundbreaking book, the bestselling authors of How God Changes Your Brain turn their attention to the pinnacle of human experience: enlightenment. 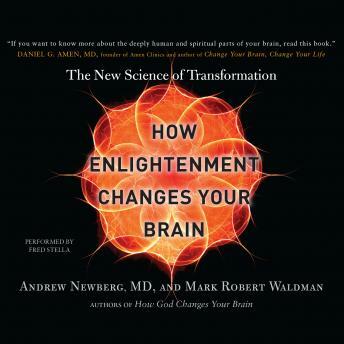 Through his brain-scan studies on Brazilian mediums, Sufi mystics, Buddhist meditators, Franciscan nuns, Pentecostals, and participants in secular spirituality rituals, Andrew Newberg, MD, has discovered the specific neurological mechanisms associated with an enlightenment experience-as well as the practical strategies to activate those circuits in our own brains. Newberg surveyed more than two thousand people who have experienced enlightenment, and discovered that they have had profound, positive life changes in the aftermath. Enlightenment offers us the possibility to break bad habits, improve our collaboration skills and creativity, become less prone to anxiety and stress, and lead happier, more satisfying lives. Relaying the story of his own transformational experience, as well as including the stories of many others who try to describe an event that is truly indescribable, Newberg brings us a new paradigm for deep and lasting change.